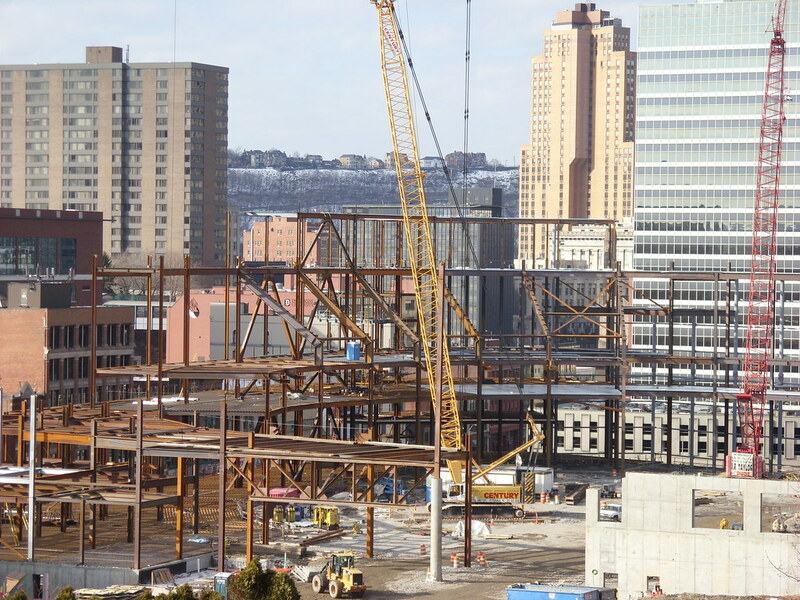 The steel superstructure is being used for the entire seating bowl. I am too lazy to find the article on here in order to give the link, but I definately remember the article stating the steel has arrived on site and most of the upper deck seating will be done by April. I have no knowledge of how other arenas have been built and have no structural engineering experience either, but my best guess is that it is almost necessary to use steel for a structure like this, due to the multi-layered seating structure. An optimist and a pessimist have one common viewpoint; their dislike of a realist. 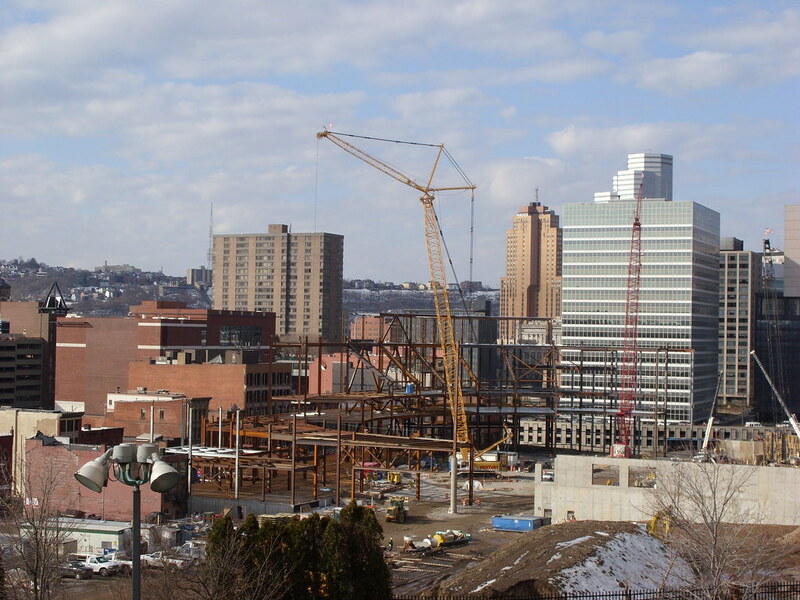 Activity on the site has definitely increased in the past few weeks, with steel and concrete rising at a rapid rate. Allow me to indulge in a massive photo-update, as this was my first chance to go down there in months and see it myself. More Cranes (There's at least 5 of them there now). Talk about your jungle gyms! Has anyone seen renderings of the inside? I'd like to see how the upper/lower decks of seating are going to look like. CONSOL Energy purchased the naming rights last year. 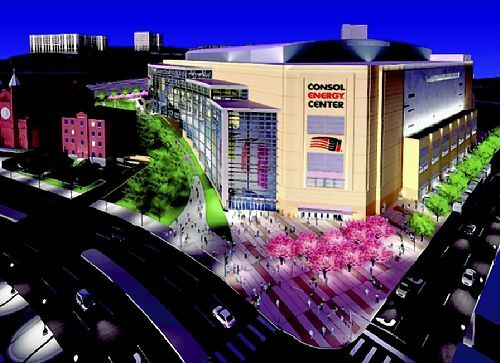 The new arena will now be called the Consol Energy Center. Check out SmartaMarta for all things MARTA! Haven't seen anything other than generic renderings. I've heard they want to emulate Philips Arena in Atlanta in that all of the luxury boxes will be stacked on one side of the seating bowl. I drove past the site yesterday. I love how you can see the "bowl" of the seating beginning to take shape. I drove past it last night; It's really coming along! Location: Bonn, Afcent, and now Philly. One would assume this arena can be retrofitted for an nba team if Pittsburgh decided to bid on one in the future. Correct? Philadelphia: A Major Milestone In America's Progress! 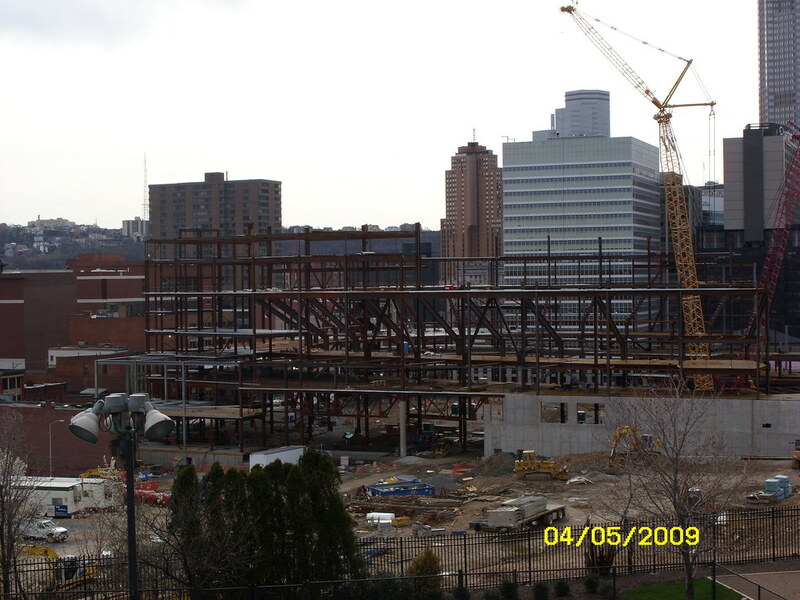 The new Pittsburgh development thread is up. Artist's drawings show what the Consol Energy Center will look like from the inside. Hockey nights in Pittsburgh might never be the same. Not when you can sink your fanny into a cushy leather seat, drink from a fully stocked refrigerator, watch replays on a flat-screen TV, and have access to a concierge. They are just some of the amenities that await lucky fans -- well, mainly corporations -- who have the financial heft to pluck down $115,000 to $150,000 a year for one of 66 suites that will be available in the Penguins' new home. 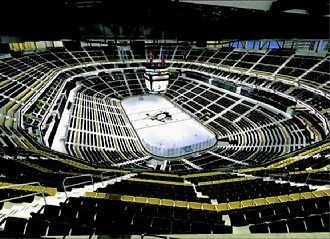 For those on more meager budgets, the Consol Energy Center still will offer more comfort than Mellon Arena, with padded seating, more leg room and spacious open concourses from which fans can watch the action even while waiting in line for a hot dog. "The seats in this arena will be the most comfortable in sports," said Penguins President David Morehouse. Today, about a year and a half before the new arena will open, the Penguins will begin making their sales pitch to suite, club and season ticket-holders from a marketing center at One Chatham Center, where one can visit a replica of a new suite, view a model of the Consol Energy Center, and plop down in the leather seats. Suite or no suite, the team is expecting the 18,087 seats in the new arena -- 1,147 more than in Mellon -- to go fast. With 14,000 current season ticket-holders and 5,000 fans on a waiting list, Consol Energy Center could be sold out well before the first puck is dropped, Mr. Morehouse said. "It's conceivable that we could sell out before we get to the general public [to sell tickets]," he said. But the team doesn't intend to let that happen. As in the past, it plans to hold back several thousand tickets each game for students and the general public. While the recession has sapped corporate and household budgets and drained 401K plans, Mr. Morehouse expects the demand to be strong for tickets in the new arena, which will open before the 2010-11 hockey season. He noted that the team sold out all of its 53 suites in Mellon Arena for the first time this season and had a 96 percent retention rate on season ticket-holders. It also has sold out every home game in each of the last two seasons. Most suite holders also have expressed an interest in moving into the new arena, he said. "If the economy is still in trouble in 2010, we're all in bigger trouble than selling an arena," he said. The prices for the 12-person suites will be up from the current $95,000 to $100,000. There will be 66 in all, including four party suites that can be rented for a single game. For those who can afford them, the suites, in addition to the leather seating and flat screen TVs, will pamper guests with Italian ceramic tile flooring, bamboo cabinets, and quartz countertops. The suites, which will open directly into the arena bowl, will be in the middle of the new building, not at the top as they are at Mellon. Club seats will be located in rows 1 through 26 at center ice. There will be 2,000 in the new arena, 200 more than in Mellon. Prices will go from the current $127 a game to $150 at Consol. The Penguins also will offer a new loge box priced between a suite and club seat. While the pricing hasn't been set for most of the other seats, officials said 41 percent of all tickets, all in the upper concourse, will be priced below $50. Some will be as low as $22. Mr. Morehouse said the pricing is designed to keep the team about mid-point in the National Hockey League, while enabling it to stay competitive. Unlike other major professonal leagues with more lucrative national television contracts, such as the National Football League or Major League Baseball, hockey teams rely more on ticket sales as a chief source of revenue. Although interest in booking events at the new Consol Energy Center has been brisk, the success of the arena will hinge on how well the region’s economy picks up by the time it opens next fall. Consol Center is expected to generate between 20 percent and 30 percent more revenue than Mellon Arena, while boosting the value of the Penguins franchise by 40 percent or more. But the condition of the overall economy will determine what kind of an impact the 18,087-seat arena will have on the region, according to Dave Synowka, director of sport management at Robert Morris University. Attendance at arena events depends on discretionary income, which hinges on employment numbers and overall economic vitality. The souring economy has cost sponsors for nearly all major sporting events, including NASCAR, PGA and professional basketball, Synowka said. Ticket sales also have been soft. The economy is “a huge factor right now,” he said. Robert Morris is among the groups trying to attract the Frozen Four, an NCAA hockey playoff event, which is the kind of thing that may ultimately boost the number of visitors to the city. Between hockey and other events, the new arena will draw an estimated 1.5 million visitors a year, according to the Sports and Exhibition Authority, which will own the arena with Allegheny County. The size and configuration of the new facility will allow between 20 and 25 more nonhockey events to be scheduled annually than at the 16,940-seat Mellon Arena, according to Hank Abate, senior vice president of West Conshohocken, Pa.-based SMG, which will manage the new facility. “Concerts will play a big part,” he said. “We can also go back in the hunt for the NCAA events,” including wrestling and men’s and women’s basketball. Those kinds of events are important because they can attract people from outside the region instead of simply moving existing fans from one facility to another, Synowka said. Hotel occupancy will probably be the best indicator of the arena’s economic impact, an area where Pittsburgh has done well in recent years. Between 2004 and 2008, the city’s rate of hotel occupancy growth was second in the country, trailing only New Orleans, according to Craig Davis, vice president of sales and marketing at VisitPittsburgh. “Our local banks and other institutions are still faring very well, and business travel is strong in the city,” Davis said. “With the new facility, I think you would get a bump in visitation. During 2007, the most recent year data is available, Allegheny and the surrounding 10 counties had 9.7 million overnight stays by visitors, according to state data prepared for Visit Pittsburgh. That’s up slightly from 9.6 million visitors in 2005, the last year the survey was done. Lodging revenue is expected to decline this year because of the recession, but the losses for the Pittsburgh region are expected to be smaller than other parts of the country, according to a study released last month by Atlanta-based PKF Hospitality Research. Revenue per hotel room is expected to fall 13.7 percent nationwide this year and a turnaround is not expected before the first quarter of 2011, according to the study. Between 70 percent and 80 percent of a hotel’s performance is linked to the local economy, but the room revenue decline for the Pittsburgh market in 2009 was expected to shrink 6.8 percent, one quarter the decline of New York City and the lowest of nine markets surveyed. Penguins seeking top rating as greenest sports venue in U.S.
Pittsburgh's new arena not only will be the newest in the National Hockey League when it opens in 2010 but the greenest in sports. On Earth Day, the Penguins and the city-Allegheny County Sports & Exhibition Authority announced that they will seek a LEED Gold certification for the $321 million complex, which is being built adjacent to Mellon Arena. The LEED Gold rating not only would be the first for any arena in the National Hockey League but also the first for any major sports venue in the country, according to the U.S. Green Building Council, the developer of the Leadership in Energy and Environmental Design system. Gold is the second-highest of the four possible certifications under LEED. In that respect, the Consol Energy Center would outdo two other new sports venues -- the $1.5 billion Yankee Stadium and the $850 million home of the New York Mets, neither of which achieved any level of LEED certification. "We're delighted not just to be certified but to be a leader in the field," Penguins CEO Ken Sawyer said yesterday. After touring the arena site, Mayor Luke Ravenstahl said having such a high-profile building be so environmentally friendly can only help bolster the city's image in the eyes of the world. "When you have the only NHL hockey arena that's a [LEED Gold] building, that's going to speak volumes to the rest of the country that Pittsburgh is a progressive city, it does invest in environmentally sustainable policies, and it's good news when you talk about the image of Pittsburgh and all that we're achieving here toward that end," he said. Of major sports venues, the Washington Nationals' ballpark in Washington, D.C., has a LEED Silver designation, the third-highest, and arenas in Atlanta and Miami have basic LEED certification, according to the Green Building Council. The Consol Energy Center would join 14 other buildings in Pittsburgh as gold-certified, including the David L. Lawrence Convention Center. Penguins officials, who are overseeing the construction, always wanted to achieve the basic level of LEED certification in the arena. But as they researched the matter more, they realized they had the chance to reach gold. "We wanted to have it happen. We wanted to get gold," Mr. Sawyer said, adding the decision won't increase the project's $321 million budget. LEED certification is based on a system that awards points in categories such as energy and atmosphere, building materials and resources, water efficiency, indoor environmental quality, and innovation and design. The Penguins will benefit from some of the building's signature design features, such as the huge glass atrium that will face Downtown and spacious open concourses, both of which will bring in more natural light, one of the factors in the ratings. Officials also are hoping to earn points for the amount of green space around the building, recycling, using materials bought locally for construction, the purchase of at least some electricity from "green" power sources, water management, indoor air quality, heating and cooling efficiency, and the selection of environmentally friendly paints. Mr. Sawyer said the arena also could benefit from its urban location and its proximity to public transit. "If we built out in the suburbs on a piece of farmland, that's a negative," he said. The team won't know for sure until after the arena opens whether it achieved the designation. But Mr. Sawyer said he was "pretty comfortable" that there will be more than enough points available to earn the rating. While many of the green features might not be readily noticeable to fans, they, too, will profit from better air quality, improved heating and cooling, and other environmentally friendly aspects, he said. During yesterday's tour, Mr. Sawyer said the arena is on pace to open before the 2010-11 hockey season. 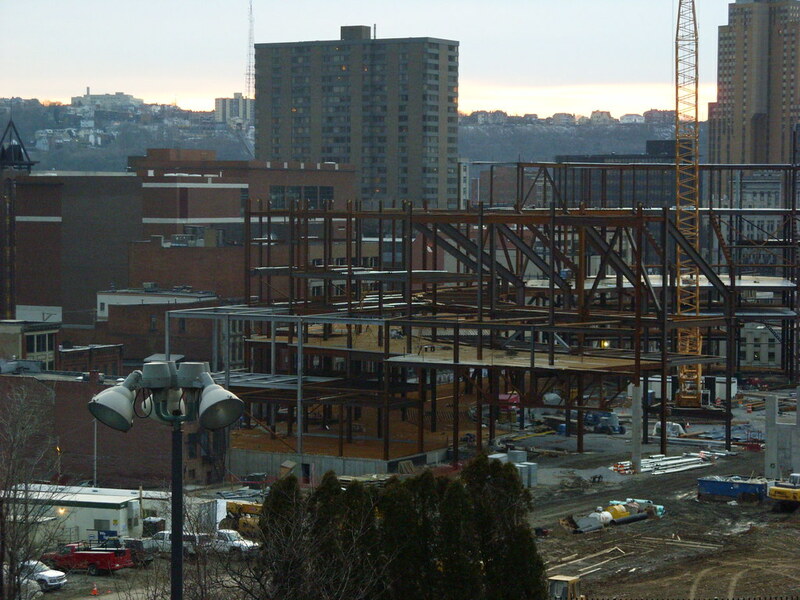 Much of the building's structural steel has been erected and some of the seating bowl and open concourses already are taking shape at the site. Center ice is now a concrete slab covered by a three-foot-high mound of dirt. But it won't be that long before the first puck drops. "I couldn't be happier," Mr. Sawyer said. "We're on schedule, on time and on budget. It's going to be one terrific building."